My trick to long-distance hiking is not to stop hiking. Stopping for even a five-minute break means a good ten minutes of creaky bones and joints before I’m moving smoothly again. 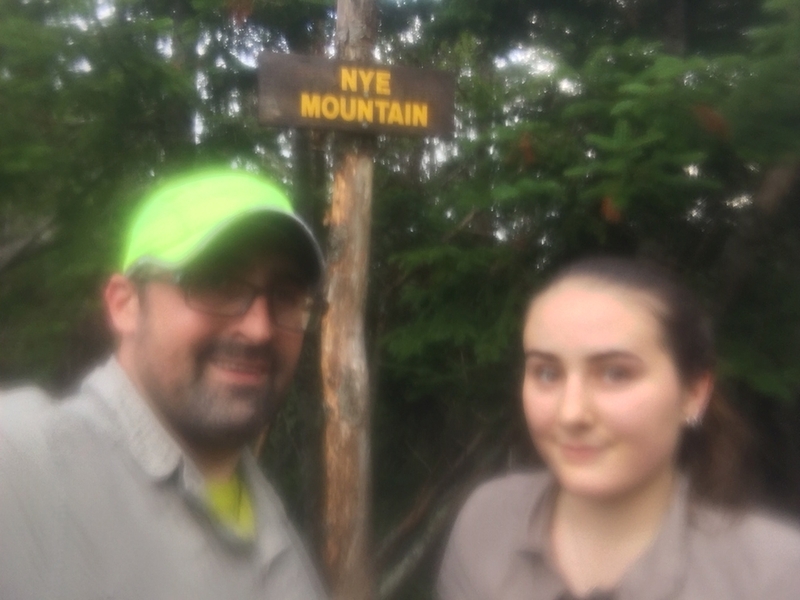 The time between coming off Cascade and Porter, my teen daughter’s and my first two of the 46 Adirondack High Peaks, and starting the approach trail to Street and Nye, was a solid two hours, if not more. True to form, the foul weather held off for the 14-mile drive, check in at the ADK Loj at Heart Lake, finding our canvas cabin, parking the car, unpacking a bit, resupplying our packs, eating lunch, and even a visit to the ADK visitors center and shop. No. The rain didn’t start until we were on our way down the trail. Both the guidebook and our briefing from the volunteer at the visitors center warned us of not getting turned astray by seasonal ski trails. So when we saw the sign for the Old Nye Ski Trail, we smugly gave it a pass. It wasn’t until the trail swung south past the Rocky Falls Shelter that we confirmed our suspicions that we missed the trail to Street and Nye and were, in fact, on the Indian Pass Trail. Using the Old Nye Ski Trail as our outside boundary, we backtracked to a faint intersection with another seasonal ski trail. 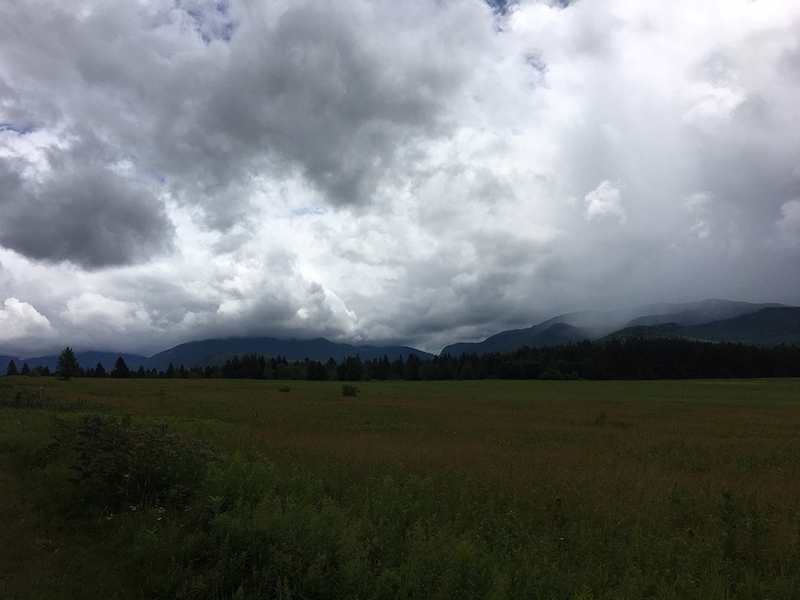 It was when we reached this intersection that the heavens really opened up with punitive buckets of rain upon our heads. Typical. The ski trail seemed like the best bet, but the trail only appeared to go off to the south. We tried to justify some runoff ruts as the remnant of a trail northwest toward our mountains, but we were soon bushwhacking. We trudged through the undergrowth with the hopes of picking up the correct trail. However, the thickening forest, dramatic drops in elevation, and the worsening rain forced us to turn around and look for a better option. We backtracked some more toward the trailhead to see if we could find another trail. Before long we were back at the Old Nye Ski Trail. It was 1:30 p.m.
With no other viable option, and despite our better judgment and the warnings against it, we headed down the ski trail, justifying the choice as the name “Nye” was on the sign. 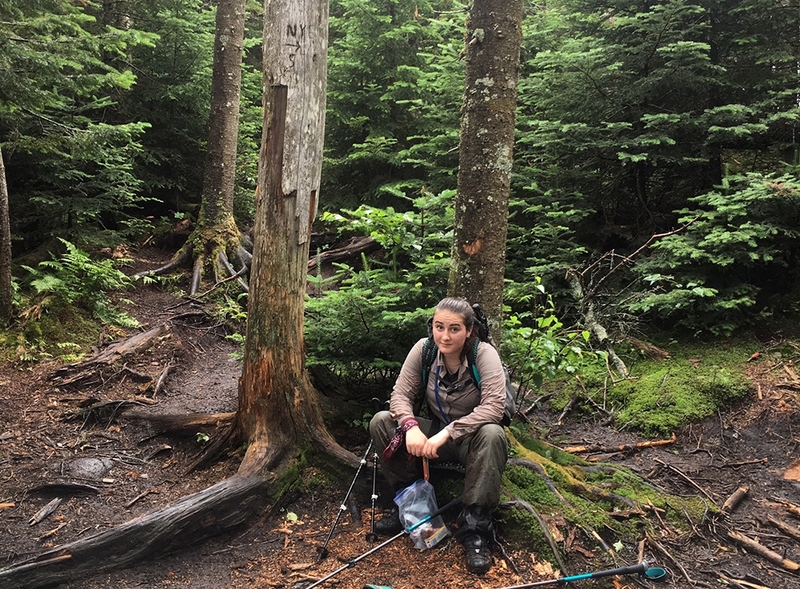 To her credit, the trail junction was tantalizingly close to camp, and after losing an hour and a half to being lost, and being soaked to the bone, my daughter would have been justified in wanting to abandon our ambition of hiking four mountains in the day. Instead, she intrepidly lead us on down the questionable path. The trail was arrow straight in the direction of the mountains. What’s more, the rain lightened, which we took as a good omen. We hit Indian Pass Brook, which was a landmark leading to the mountains. The water was reasonably high. While we determined the best spot to cross, a young family emerged from the woods on the other shore. They asked where we were headed. When we told them Street and Nye, they looked grim. “Is this not the way?” I shouted across. “No, this is the trail. It’s just that you’re about two hours from the summit. You’ll be hiking out in the dark if you are going to try for it,” said the mother. “We have headlamps,” answered my daughter, as she hopped across the brook. I thanked them for the information, and they wished us luck. 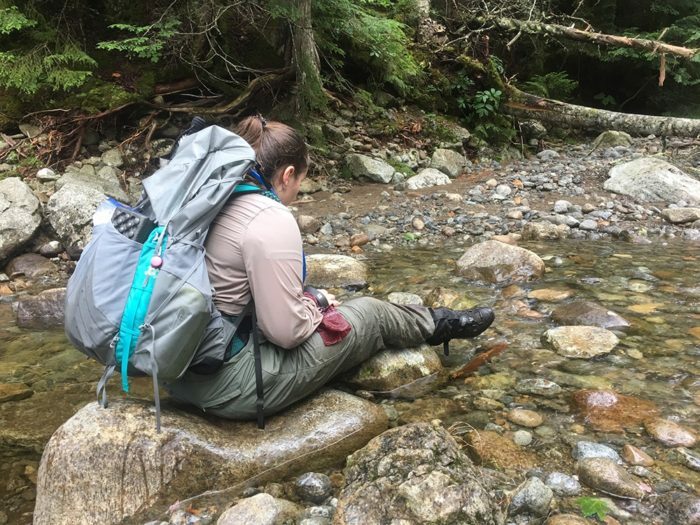 The climb started immediately after the brook; the trail near the water was loose and mossy, suffering from severe erosion. Once over the first rise, the trail firmed up under and among evergreen trees. The trail rolled along, always rising until the proper climbing started. The trail all but disappeared, replaced by a wide rock and tree scattered mountainside. We were free to pick our own lines up the technical hiking. About an hour after we crossed the brook, we met two older hikers descending the rock field slowly. The man at the back was struggling, but luckily had hiking poles to ease his pain. They were surprised to see anyone else on the trail, with the late hour and the poor weather. “We thought we were the last two on the mountain for today,” said the stronger man. “And we certainly didn’t think we’d meet anyone on their way up,” added the weaker one. “You have headlamps, I hope. You have a good two hours to the summit,” said the strong one. “Let’s rethink the plan in an hour and if we need to bail, we’ll bail,” I said. In another hour of serious climbing, we emerged from close, overgrown trail into a wide and flat muddy clearing, ringed with gray, dead trees. Two trails branched off in opposite directions. An unsophisticated carving into one of the dead trunks pointed left for Street and right for Nye. We pushed back into closely overgrown narrow trail up to the summit of Street. It took us half an hour. By the time we hit the top, the sky was sapphire blue. Glimpses of stunning views had teased us at bends in the trail, but the top was a small wood-covered spot, just big enough for us to peek over the treetops and snap a picture.We were down to the intersection to Nye in 15 minutes. Figuring her eagerness was due to the failing light, I expected that we were going to be headed down the mountain. To my pride and delight, she headed off to the left toward Nye without missing a step. We hit Nye in no time. The wooded summit was as equally disappointing as Street’s. The sun, again hidden behind rainy clouds, was low nearing the mountain tops across the valley, but the sky was still bright above the trees. Our stop on Nye was brief. Getting down was now the mission. We made short order of the descent, arriving where we had met the two older men quickly. Getting to the brook also seemed to fly by with little effort. The evening half-light of the woods seemed to linger longer than expected, and when we emerged out into the opening at the brook, the sky was clear and blue once more. We were out of water, so we stopped to refill and refresh. When we sat down on the polished, stones protruding from the water, the fatigue of the day caught us. We sat for a long while, longer than the time our purification chemicals needed to do their job. When it was time to go again, I didn’t recognize where the trail entered the woods. We moved along the shore looking for evidence of the way back. I led us along an animal track parallel to the water, before crossing the brook again and then backtracking. When I finally recognized the trail and started us up it, my daughter protested. “That’s the wrong way,” she said. “No. It’s the right way,” I countered. “I can’t tell if you’re joking. Surely you can’t think that is the right way,” she said. I stopped and looked at the trail. It was loose and mossy and led up to a rise meeting tall evergreens. “Dad. We’ve crossed back over the brook,” she paused. “It’s going UP!” she yelled. At that moment I saw my folly. It was the trail, but the trail toward the mountains, not back to camp. When I finally recognized it, I could not figure out how I had made such an obvious mistake. I was certain in my mind. Dehydration and fatigue had gotten the better of me in the failing light. I was thankful that my daughter and her level head was with me. She spun on her heels and immediately spotted where we had come out of the woods across the brook. The relatively flat walk back to the Old Nye Ski Trail sign was longer than I wanted, but we were soon in camp unlacing our boots. We managed to climb four mountains on our first day, a point of pride for us. We also managed to get lost three times, a fact that dented my pride. In retrospect, it is good to laugh at it, and it makes for good story, but at the time, I would have appreciated clear signage or the odd trail marker. 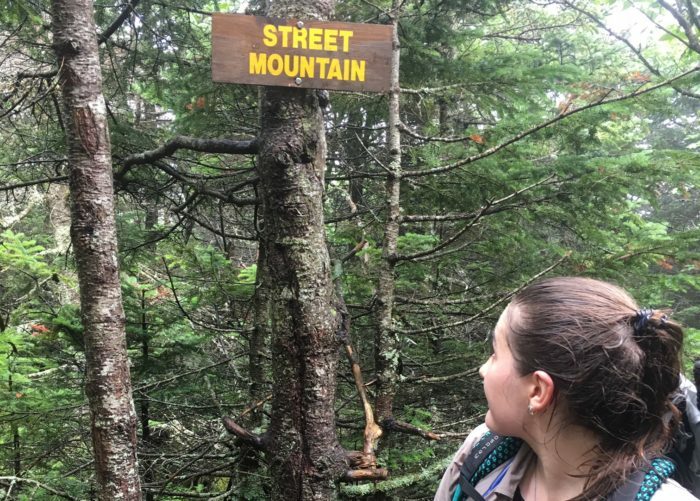 There was discussion among the staff at the ADK visitors center that the Department of Environmental Conservation (DEC) had determined that all trails in the Adirondack Park will have clear trail markers and signage installed in the next few years. The purist in me felt uneasy about the proposed implementation, as I felt it would negatively affect the character of the park. Ultimately, we achieved our goals, but did so by taking opportunities to access and reexamine our plan to make sure we were safe and having a good time. We hiked with determination, but were open to modifying our plans if circumstances warranted. The success of the day was not standing atop summits, it was returning to camp safely, resting our bodies, and unlacing our shoes, able to look forward to another day in the woods.